Roger Murtaugh has just turned 50, and only has a few more years to go before he retires from the Los Angeles Police Department. Martin Riggs has just lost his wife in an accident, and doesn't care if he lives or dies. 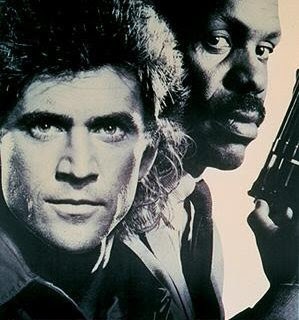 When they are paired together, Murtaugh has problems with Riggs suicidal attitude towards work, as they investigate a drugs baron dubbed "The General". Los Angeles police sergeant Roger Murtaugh, who has just turned 50 years old, is assigned to investigate the death of Amanda Hunsaker, a prostitute who is one of the daughters of bank president Michael Hunsaker, a friend whom Roger has known since they were in the Vietnam War together, but Roger hasn't seen Michael in 12 years. Beginning with this investigation, Roger is assigned a new partner Sergeant Martin Riggs, who has been suicidal ever since his wife Victoria "Vicky" Lynn Riggs died in a car crash in 1984. Riggs and Murtaugh's investigation of Amanda's death reveals that she was murdered. Upon hearing of this, Michael tells Murtaugh that he would like for whoever is behind Amanda's murder to end up dead, like Amanda. Riggs and Murtaugh's investigation continues and it makes them the targets of Shadow Company, a group of former Vietnam War era mercenaries who now bring heroin into the Los Angeles County region. Shadow Company's leader, General Peter McAllister, and his right hand man, Mr. Joshua, want Riggs and Murtaugh dead, no matter what the cost.